Entira Family Clinics is committed to providing the highest quality of healthcare to all its patients and clients. We seek the best-qualified candidates for all positions within our organization. Physician opportunities are currently available. We are also recruiting Physician Assistants and Nurse Practitioners for Clinic and Retail positions. Please contact Len Kaiser at 651-772-1572 or lkaiser@entirafamilyclinics.com. 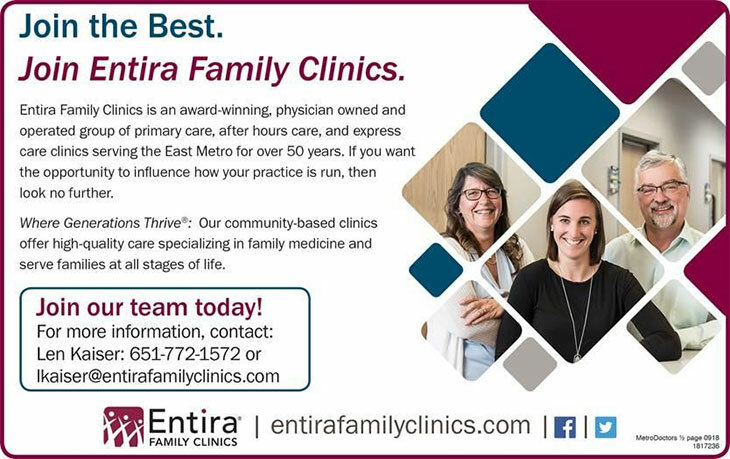 Join Entira Family Clinics! As specialists in family medicine, our providers care about our patients and have special relationships with them. We pride ourselves in providing excellent medical care and improving our patients’ well-being.In addition, Entira Family Clinics is physician owned and operated. At Entira Family Clinics we care about our patients and have special relationships with them. We pride ourselves in providing excellent medical care and improving our patients’ well-being. For physician, physician assistant and nurse practitioner inquiries, please contact: Len Kaiser at lkaiser@entirafamilyclinics.com or 651-772-1572. The mission of Entira Family Clinics is to provide comprehensive, patient-centered medical services, in family medicine clinics located in your neighborhood. As an independent organization of physicians, we are uniquely prepared to provide the highest quality of care and value for our patients and staff. Entira Family Clinics will be a leader in improving the health of our community through the delivery and coordination of family and patient-centered healthcare services. We will be the clinics of choice for patients, employees, providers and the communities we serve.